Edgar Prado gives Limited View a pat after winning the Marshua Stakes. Photo by Dottie Miller. 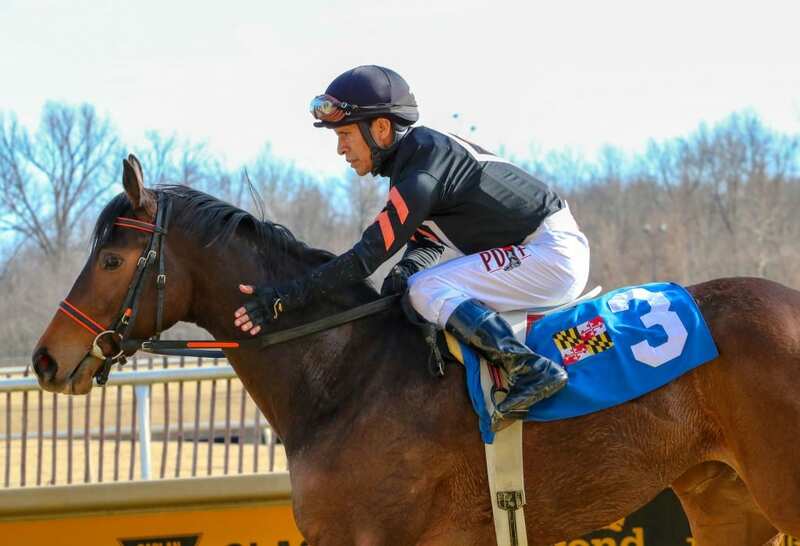 Multiple stakes-winning Maryland-bred 3-year-old filly Limited View breezed four furlongs in 45.40 seconds Saturday at Laurel, the fastest of 59 horses at the distance, in preparation for her next start March 17. The question is, what will her next start be? Trainer and co-owner John Salzman Jr. nominated the daughter of Freedom Child to both the $100,000 Beyond the Wire for sophomore fillies at one mile and the $75,000 Conniver at seven furlongs for state-bred females 3 and up, two of five stakes worth $450,000 in purses on the St. Patrick’s Day program. It was the third work for Limited View since capturing the six-furlong Marshua Stakes Jan. 27 in her 3-year-old debut. Limited View won the Maryland Million Lassie and Maryland Juvenile Championship at 2 before ending her juvenile season finishing off the board in the Gin Talking Stakes Dec. 30.